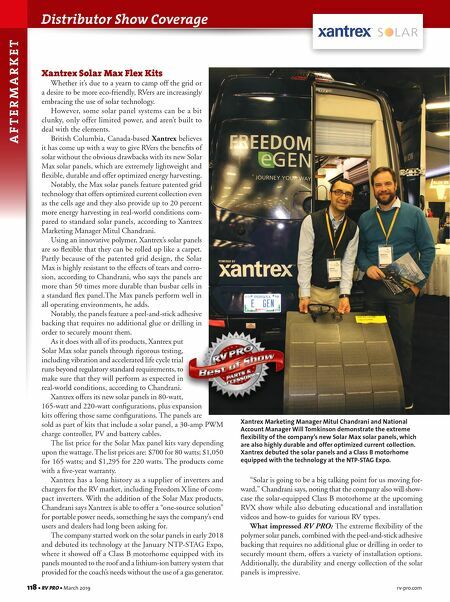 Distributor Show Coverage 118 • RV PRO • March 2019 rv-pro.com A F T E R M A R K E T Xantrex Solar Max Flex Kits Whether it's due to a yearn to camp off the grid or a desire to be more eco-friendly, RVers are increasingly embracing the use of solar technology. However, some solar panel systems can be a bit clunky, only offer limited power, and aren't built to deal with the elements. British Columbia, Canada-based Xantrex believes it has come up with a way to give RVers the benefits of solar without the obvious drawbacks with its new Solar Max solar panels, which are extremely lightweight and flexible, durable and offer optimized energy harvesting. Notably, the Max solar panels feature patented grid technology that offers optimized current collection even as the cells age and they also provide up to 20 percent more energy harvesting in real-world conditions com- pared to standard solar panels, according to Xantrex Marketing Manager Mitul Chandrani. Using an innovative polymer, Xantrex's solar panels are so flexible that they can be rolled up like a carpet. Partly because of the patented grid design, the Solar Max is highly resistant to the effects of tears and corro- sion, according to Chandrani, who says the panels are more than 50 times more durable than busbar cells in a standard flex panel.The Max panels perform well in all operating environments, he adds. Notably, the panels feature a peel-and-stick adhesive backing that requires no additional glue or drilling in order to securely mount them. As it does with all of its products, Xantrex put Solar Max solar panels through rigorous testing, including vibration and accelerated life cycle trial runs beyond regulatory standard requirements, to make sure that they will perform as expected in real-world conditions, according to Chandrani. Xantrex offers its new solar panels in 80-watt, 165-watt and 220-watt configurations, plus expansion kits offering those same configurations. The panels are sold as part of kits that include a solar panel, a 30-amp PWM charge controller, PV and battery cables. The list price for the Solar Max panel kits vary depending upon the wattage. The list prices are: $700 for 80 watts; $1,050 for 165 watts; and $1,295 for 220 watts. The products come with a five-year warranty. Xantrex has a long history as a supplier of inverters and chargers for the RV market, including Freedom X line of com- pact inverters. With the addition of the Solar Max products, Chandrani says Xantrex is able to offer a "one-source solution" for portable power needs, something he says the company's end users and dealers had long been asking for. The company started work on the solar panels in early 2018 and debuted its technology at the January NTP-STAG Expo, where it showed off a Class B motorhome equipped with its panels mounted to the roof and a lithium-ion battery system that provided for the coach's needs without the use of a gas generator. Xantrex Marketing Manager Mitul Chandrani and National Account Manager Will Tomkinson demonstrate the extreme flexibility of the company's new Solar Max solar panels, which are also highly durable and offer optimized current collection. Xantrex debuted the solar panels and a Class B motorhome equipped with the technology at the NTP-STAG Expo. 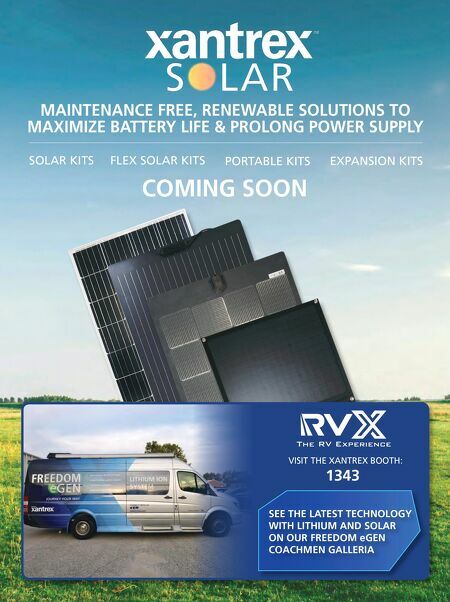 "Solar is going to be a big talking point for us moving for- ward," Chandrani says, noting that the company also will show- case the solar-equipped Class B motorhome at the upcoming RVX show while also debuting educational and installation videos and how-to guides for various RV types. What impressed RV PRO: The extreme flexibility of the polymer solar panels, combined with the peel-and-stick adhesive backing that requires no additional glue or drilling in order to securely mount them, offers a variety of installation options. Additionally, the durability and energy collection of the solar panels is impressive.